Anaphase-promoting complex subunit 5 (ANAPC5) belongs to the APC5 family and is a component of the anaphase promoting complex/cyclosome (APC/C), a cell cycle-regulated E3 ubiquitin ligase that controls progression through mitosis and the G1 phase of the cell cycle. The APC/C complex acts by mediating ubiquitination and subsequent degradation of target proteins: it mainly mediates the formation of 'Lys-11'-linked polyubiquitin chains and, to a lower extent, the formation of 'Lys-48'- and 'Lys-63'-linked polyubiquitin chains. 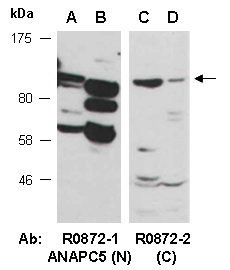 Rabbit polyclonal antibodies were produced by immunizing animals with GST-fusion proteins containing either the N-terminal [ANAPC5 (N) (R0872-1)] or the C-terminal [ANAPC5 (C) (R0872-2)] region of human ANAPC5. Antibodies were purified by affinity purification using immunogen. ANAPC5 at RT for 2 h.